Saving Literacy provides theory and practice around scribbling and drawing, showing professional caregivers how to develop attention, connection, speech and literacy. Benchmarks, evaluation tools, research questions, autism, technology discussed. Dr. Susan Rich Sheridan is a scholar/teacher with degrees in English, Art, and Education. Her book, Saving Literacy, introduces a brain-based theory and a Scribbling/Drawing/Writing practice for children 10 months to six years. 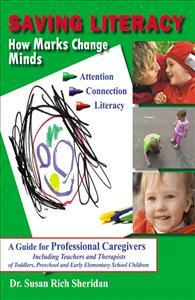 Developmental benchmarks, lesson plans, evaluation tools, and research questions are included, designed for professional caregivers: preschool and daycare providers, elementary school teachers, art teachers and therapists, child psychologists, speech pathologists, and researchers in child development, education and brain science. The goals of the program are sustained attention, emotional control and connection, expanded speech and literacy. Autism and the effects of technology are discussed.